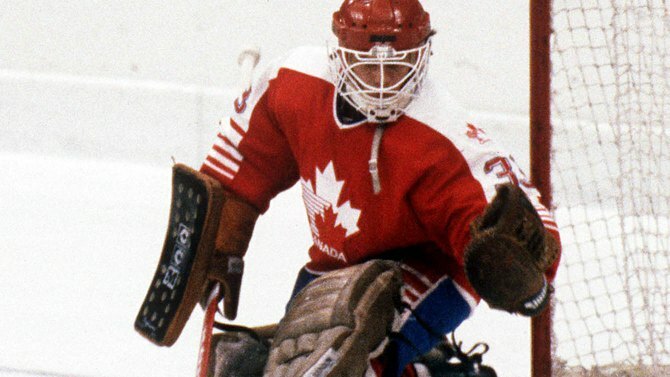 Mario Gosselin tending goal for the 1984 Canadian Olympic team. It could have been because of the style he played, or the big games he played in, but likely the reason Mario Gosselin was one of my favourite goaltenders of all time was simple: he showed up to play for his country at a time when it really was a sacrifice to play for the Olympic team. Gosselin played his junior in the Quebec Major Junior Hockey League, and was a draft pick of the Quebec Nordiques. He was from Thetford Mines, I always remember that, and was the only one from that town ever to play in the Olympics. He was just 20 years old when he answered the call to play for Team Canada. Back then, it was a full-time, on-going commitment. Professionals were not even allowed in the Olympics, much less the NHL shutting down for two weeks allowing the best to play. Instead, aspiring Olympians had to forsake playing pro, live on hamburger and macaroni and cheese, and play all sorts of exhibition games leading up to the Olympics. The Canadian Olympic team had turned a corner by 1984 though. Dave King had become coach, and he had already tasted success by coaching Canada to its first ever World Junior Hockey Championship gold medal in 1981. He set his sights on Olympic gold, and was even able to persuade some of the players from his junior championship team to come over to the Olympic team. However, he still needed to anchor that team. Strong goaltending was essential, and that was most evident in the world champion and Olympic gold medal favourites from the Soviet Union. Tending goal for them was perhaps the greatest international goalie in history, Vladislav Tretiak. If Canada hoped to compete with the likes of the Soviets and the Czechs, they would need strong goaltending. He joined the Olympic team for the 1983-1984 season and would remain for two years, sharing the goaltending duties with Darren Elliott. Gosselin played 36 games for the Olympic team, but almost didn’t play in the Olympics. The International Olympic Committee, the absurd entity it was, was strict on ensuring athletes were amateurs. Gosselin had signed a professional contract, and two countries including our old friends from the United States, wanted him ruled ineligible. However, the IOC ruled that because Gosselin had not played a professional game, he was eligible for the Olympics. He emerged as one of the stars of the tournament, backstopping the Canadians to four straight victories to open the tournament. The medal round was more complex then, but the net result was that Canada won no games in it, finishing fourth in the tournament and out of the medals. It was still a solid accomplishment for a team that had not come that close to a medal in decades. Mario Gosselin had been selected 55th overall by the Quebec Nordiques in the 1982 NHL entry draft. He joined the Nordiques after the Olympics. He made his NHL debut on Feb. 26, 1984, shutting out the St. Louis Blues by a score of 5-0. It was an incredible debut. He would appear in three games that season, finishing with a 2-0 record. the Quebec Nordiques in the mid and late 1980s. 1984-1985 season would be Gosselin’s rookie season with the Nordiques. He would appear in 35 games and finish with a 19-11-3 record. Quebec finished second in the Adams Division, setting up a date with Buffalo in the first round of the playoffs. The Nordiques won the best-of-five series 3-2, advancing to play Montreal in the Adams Division final. The Nordiques finally got the monkey off their back, defeating the Canadiens 4-3. I recall watching that series closely as Gosselin was excellent in net. The win set up a showdown in the Wales Conference Final against the Philaldelphia Flyers. The Nordiques stayed close, splitting the first four games, but the Flyers took control to win the next two games, and the series 4-2. Gosselin played in 17 of the 18 games, finishing with a record of 9-8. He was the winning goalie in all nine games Quebec won too. The 1985-1986 season found Mario displaced as the starting goaltender by Clint Malarchuk. Still, Gosselin played in 31 games, with a record of 14-14-1. The Nordiques finished first in the Adams Division, but were swept 3-0 in the opening round by Hartford. Gosselin got into just one game, playing 40 minutes but allowing five goals. This proved to be Goselin’s most successful season. He finished second in fan balloting for the NHL all-star game in Hartford. The top vote getter was Pelle Lindbergh of the Philadelphia Flyers who had backstopped his team to an appearance in the Stanley Cup final the year before, that also included a victory over Quebec. Lindbergh died in a motor vehicle accident eight or so games into the season. Consequently, on Feb. 4, 1986, Mario Gosselin started for the Wales Conference all-stars, and allowed just one goal in 31 minutes of action. The Wales Conference ultimately won 4-3 in overtime. 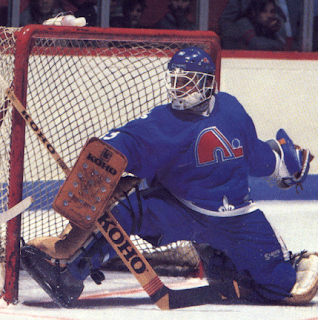 Malarchuk was firmly entrenched as the number-one goaltender in the 1986-1987 season. Gosselin did appear in 30 games, for 13-11-1 record and a team best goals against average of 3.18. The Nordiques played role reversal with Hartford as Quebec finished fourth and the Whalers were first in the Adams Division, setting up a first-round re-match from the previous year. Now, however, the NHL had moved to a best-of-seven in the first round. Quebec emerged victorious, winning 4-2. They advanced to play Montreal in the division final against Montreal, but again the Canadiens won in seven games. Malarchuk proved ineffective, going 0-2 in three appearances. Gosselin, on the other hand, proved he was a money goalie, going 7-4 in 11 games. The Nordiques pulled a blockbuster trade that included sending Malarchuk to Washington. Gosselin was again handed the number-one job for the 1987-1988 season. In 54 games, he went 20-28-4 with two shut outs. However, Quebec missed the playoffs. Gosselin again saw the most action of the Quebec goaltenders in the 1988-1989 season, going 11-19-3 in 39 games. Once more, the Nordiques missed the playoffs. After the season, they decided to go in a different direction and did not renew Gosselin’s contract. The end of the decade brought the end of Mario Gosselin’s time in Quebec, as he signed a contract with the Los Angeles kings. Gosselin played one year in L.A. then bounced around from Hartford to the minors and back again, playing sporadically in the NHL until his retirement after the 1993-1994 season. He had been hampered by injuries throughout his career, and it was a knee injury that finally forced him to retire. His last game was on Nov. 27, 1993 against the Florida Panthers. Back in the mid-1980s, CTV signed a contract with the NHL to start broadcasting games, mostly on Friday nights. It also gave them the broadcast rights to the Canada Cup. What I distinctly remember about those broadcasts, beyond breathing relief they had found a legitimate play-by-play man in Dan Kelley, to replace Ron Reusch, was that we got to see more Nordique games. That’s when I got to appreciate how good a goalie Mario Goselin was. However, two things shortened his career. One was injuries that seemed to dog him. The other was he was a butterfly-style goaltender. That meant he went down a lot. Eventually NHL shooters learned to beat the “Goose” they just had to shoot high as he went down. Yet, none of that is the real reason I loved Mario Gosselin. Instead, the reason I so liked him was he chose representing his country over playing professionally. Back then, being on the Olympic team was a full-time commitment, unlike today where it’s a few weeks during a break in the middle of the NHL schedule. He played for Team Canada for two years at a time where he was not allowed to earn any money from playing hockey. I will always have a special place in my heart for those true Olympians. Carey Price and Martin Brodeur may be better goalies, but I would be surprised if either of them would give up their pro contracts to live hand to mouth for a year or two while playing for the Olympic team.